The largest national park in Spain set in the highest mountains in Spain, located in Granada and Almeria. Famous for: being the southernmost ski resort in Europe, hiking paradise, boasting breath-taking view of Morocco and great view of nearby Granada on a sunny day. Hiking in Sierra Nevada – there are lots of fantastic routes in SN. In the lower parts of Sierra Nevada you will find river valleys full of trees and colourful flowers. There is a good chance you will stumble upon a small stream or a waterfall or even a rope bridge! Higher parts of Sierra Nevada have little vegetation. The higher you are, the more gravelly the routes become. Don’t be put off among gravel and jagged rocks – turn back and enjoy the magnificent panoramic views that reward you the bleak landscape in front of you. Skiing in Sierra Nevada – the sunniest ski resort in Europe boasts season that can last from late November until early May. In the village of Pradollano, the winter-sport base of Sierra Nevada, you will find plenty of hotels, apartments, restaurants and skiing shops. Sierra Nevada boasts more than 100 km of ski tracks, 22 ski lifts including two quick gondola lifts and plenty of high speed chairlifts. 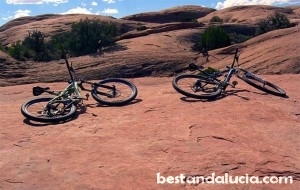 Mountain biking in Sierra Nevada – the region is a true paradise for mountain bikers. Taking a gondola lift up and then riding down the Valeta mountain or cutting through the valleys and pine forests on different specially prepared MTB tracks – it’s all possible in Sierra Nevada in the summer season. Located in the Jaen province, northernmost of the natural parks in Andalucia. Famous for: being the birthplace of Guadalquivir, hotspot for nature lovers – deep beautiful green forest dotted with little lakes, rivers and beautiful waterfalls, colourful autumn scenery; Rio Borosa – popular hiking route in the forest; home to famous Iruela castle; voted one of the top 10 national parks in Europe in the The Guardian’s readers’ travel tips in April, 2015. 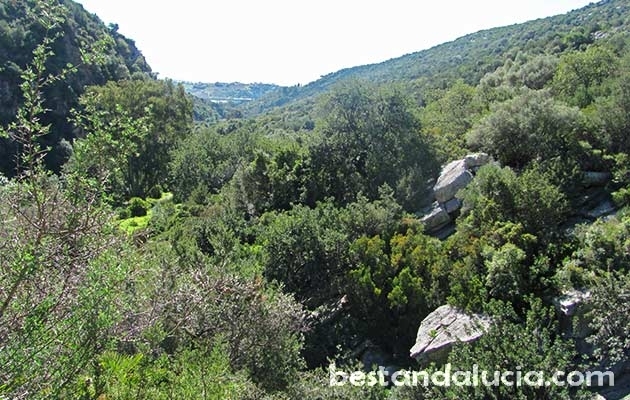 Hiking in Sierra de Cazorla – Sierra de Cazorla is a massive natural park with lots of walking tracks where you can admire spectacular lush green landscape. The topography makes it difficult to easily access many parts of the park. It’s recommended to set a base camp in Cazorla, which is the main gateway to the region, and visit the local tourist information office for maps and useful tips. Famous for: being “cork oak kingdom” (cork is used in the production of wine bottle stoppers or coasters), home to many pueblos blancos, famous sea-fog coming down to the forest from the east direction called barbas del Levante, wind farms, large quantity of birds of prey including eagles, hawks and griffon vultures. Hiking in Los Alcornocales – this peaceful forest area is superb for walking, especially for those looking for less strenuous walks. The mountains and hills are not particularly high, usually between 300-900 metres, what makes them accessible. There are lots of signposted routes, for example, near Jimena de la Frontera, Gaucin, Casares or near Tarifa-Pelayo region. 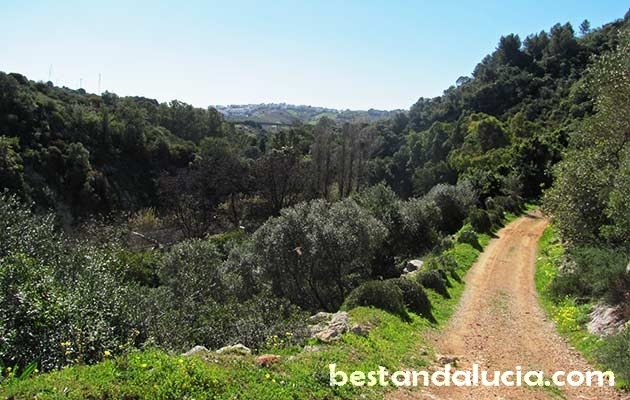 White Villages in Los Alcornocales – if you are interested in the famous Ruta de los Pueblos Blancos or simply enjoy spectacular settings and rural tourism, visit those idyllic and remote destinations hidden in Los Arconcales: Castellar de la Frontera, Casares or Gaucin. Natural reserve in the delta of Guadalquivir River, located in the Huleva region. Famous for: unique landscape formed by marshes, lagoons and sand dunes; UNESCO biosphere reserve, bird paradise – home to many rare species, some of the best virgin beaches of Costa de la Luz. Birdwatching in Donana National Park – if you are a bird enthusiast, that’s a place you cannot miss. There lots of possibilities for bird watching. There are lots of spots on the edges of the park where you can observe birds for free. However, if you want to see the interior of the Donana park, you need to book a 4-hour guided tour. It’s been reported that there might be sometimes problems with a tour in English. It’s worth to plan the tour after rainy days, in spring or autumn, when the birds are attracted to the water overflowing the marshy land. Beaches in Donana National Park – the stretch of about 20 kms Atlantic shore between the towns of Mazagon and Matalscanas offers some great beaches. Rompeculos, Parador and famous Custea Maneli are probably the three best beaches in this area. Because of the proximity to the river mouth, the water is not of the best quality there. However, in terms of tranquillity, these are some of the best beaches on Costa de la Luz. “Snowy mountains,” part of the Serrania de Ronda. Famous for: characteristic white limestone, unique and diverse fauna and flora (Spanish Fir which is Andalusian National Tree, Gall oak, mountain cat or ibex-wild mountain goat), various caverns and caves, great panoramic mountain views, profound gorges – famous Gesm abyss (1,100 m deep), Torrecila mountain (1.919 m). White villages and hiking in Sierra de las Nieves – famous Ronda (also home to the visitors’ centre for Sierra de las Nieves) is an absolute must-see when you are in the region. Idyllic village of Tolox, a perfect base for hiking also famous for the spa waters (the Fuente Amarga Spa) is also recommended. A small white town of Istan, in the Rio Verde valley, is another pleasant village to visit. The area around Istan abounds in various walking routes. The paths along Rio Verde can be really enjoyable and refreshing during the summer months! First UNESCO biosphere reserve in Spain, located on the area between Ronda and Arcos de la Frontera. Famous for: rugged mountains, limestone caverns and massive gorges; highest rainfall in Spain, vulture colonies, Garganta Verde – 400 metre vertical wall, Cueva de la Pileta in Benaojan (beautiful cave with ancient-man cave paintings), white villages of Grazalema, Zahara de la Sierra, Ubrique or El Bosque. Sports in Sierra de Grazelema – the natural park around Grazelma attracts lots of sports enthusiasts. Paragliding, rock climbing, caving as well as canoeing and kayaking on the reservoir beneath Zahara de la Sierra seem to be most popular activities. 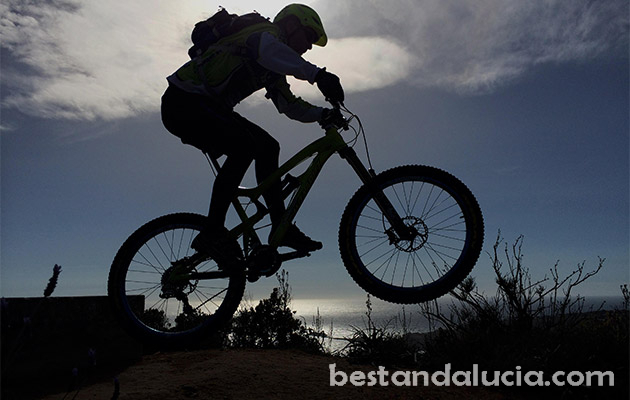 Spanish Andalucia is probably the best mountain biking region in Europe. 320 sunny days a year, very versatile landscape including valley dirt roads, narrow forest trails, bumpy trails leading down big virgin hills or dangerous rocky trails winding down formidable mountains. Andalusia is a true MTB paradise. There is something for both beginners and experts.